Attending a conference like CMWorld requires an investment. Not only is there a monetary cost for gaining access to amazing sessions, it requires an investment of time. And if you really want to get the most out of events, it’s essential that you’re planning ahead how you’ll tackle the week (which is so much more than just showing up on Day 1). As soon as the agenda for a conference is released, our team begins the process of identifying which sessions we will attend and live blog. Having a plan makes navigating a large conference much easier and more successful. 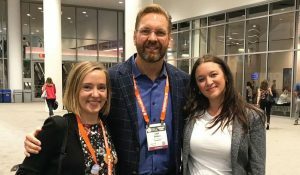 Our CEO Lee Odden has spoken at every single CMWorld to date. And I had the honor of speaking there for my very first time this year. Presenting at conferences provides a great opportunity to share the expertise of your team, and connect with attendees. If you are presenting, the quality of your content and your engagement with the audience is key for success. At large events like CMWorld, attendees spend just as much time looking at their phones as they do each other. In fact, when everyone was filing out of one of the keynotes, I noticed the crowd was moving exceptionally slow. Why? They were all furiously tweeting takeaways! When an event has a hashtag, take advantage. You’ll have access to a very engaged audience (both those attending and those participating from afar). Often at events, Chris Penn utilizes a data algorithm to identify the most talked about and engaging individuals or brands at an event. 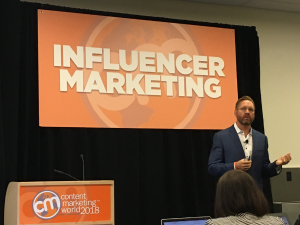 As you can see, TopRank Marketing and Lee Odden were strong contenders at this year’s CMWorld. For our team, one of the amazing benefits to attending events is the opportunity to interact with clients like the team’s at LinkedIn and DivvyHQ, partners, prospects and influencers. On Wednesday at CMWorld, we had the pleasure of hosting a dinner for some of our favorite marketers including Brock Stechman and Brody Dorland of DivvyHQ (client), Carla Johnson, Michael Brenner, Dave Charest, Mark Boothe, Peter Krmpotic, Eli Schwartz, Tim Washer and Jesper Laursen. If you didn’t get to attend all of the sessions you’d planned to, or were following from home, we have a treat for you! For a number of years, the TopRank Marketing team has partnered with Content Marketing Institute (CMI) to help provide helpful insights from top speakers. And this year was no exception! Thank You For Helping Us All Level Up! 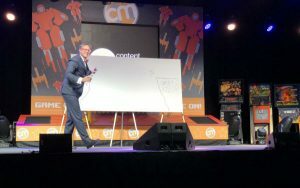 It doesn’t matter if you were a veteran speaker or first-time attendee, the beauty of an event like CMWorld is that we can all connect and learn together. If you were lucky enough to attend this great event, what was your top takeaway? Tells us in the comments section below.